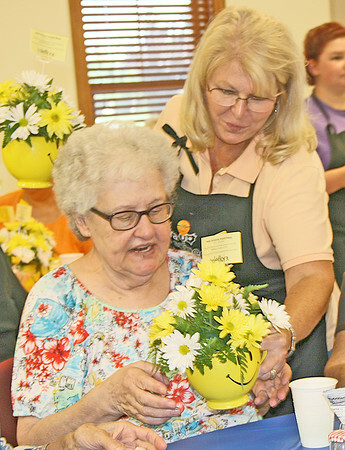 DAISY DAY: Mount's Flowers and Gifts owner Lana Hale (right) hands a mug of yellow and white daisies to Lebanon resident Mary Allen on Wednesday at Boone County Senior Services Inc. Hale, along with several 4-H and FFA members, surprised the lunch crowd with the bright bouquets. "I don't have words to say," Allen said. "It made me smile. If it doesn't make someone smile they're beyond help. They're fantastic." The mugs were donated by Teleflora, a national flower delivery company, as part of their "Make Someone Smile Week." This was the first year that Mount's has been able to participate, with flowers donated by three of the company's wholesalers, Hale said. On Tuesday, the company delivered bouquets to Homewood Health and Hickory Creek. Hale, along with her student volunteers, put together about 96 bouqets total, she said. On Wednesday they planned to take extras to the Lebanon Police Department and the Boone County Sheriff's Office. The flowers lit up a lot of the lunch-goers faces on Wednesday, said BCSSI executive director Anita Bowen. "I've seen a lot of smiles around the room," Bowen said. "It seems amazing."